Victoria suggests an alternative to the New Year detox with an amazing cake to brighten up a wintry afternoon. 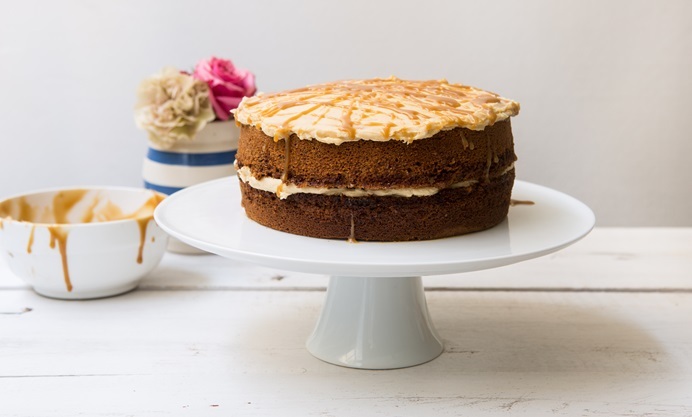 Based on the perfect British winter dessert – the sticky toffee pudding – why not indulge in a sticky toffee cake? So, January. Here we go again. The time of year when gym memberships go up and the diet police come out, full-throttle, wiggling about in leotards and wagging their bony fingers at us, stirring up shame and dishing up huge dollops of self-disgust. I’m tired of them spoiling the whole of January by making us regret our festive right to have a merry and indulgent Christmas. All these guilt-inducing fad diets only send me, weeping, into the arms of the biscuit barrel. Based on the most perfect British winter dessert – the sticky toffee pudding – this cake is basically an up yours to the January detox. Rich and sweet, without being sickly, sticky toffee cake will brighten up a wintry afternoon in no time. It has the added bonus of not requiring you to remember to take the butter out of the fridge to come up to room temperature before you put your pinny on. And it has dates in, so it’s practically one of your five-a-day.